Prominent & Leading Manufacturer from Mumbai, we offer transmission chain. 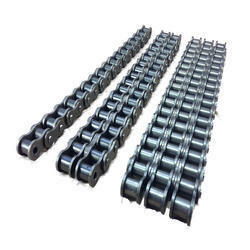 We are the leading manufacturer and supplier of Transmission Chain. These chains are highly durable in nature and can easily work in glitches. A transmission Chain consists of a series of journal bearings held in precise connection to each other by constraining link plates. This chain is available in various specifications as per the requirements of clients. Looking for Transmission Chain ?